13+ Scion FRS Mud Flaps. Mud Flaps for Scion FRS. Choose from Rally Armor Mud Flaps in Black, Red or Silver. FRS Mud Flaps are bolt-on and give you that rally style look. 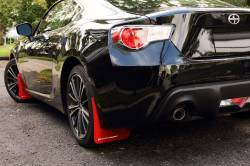 Scion FRS Mud Flaps are sold as a 4pc Complete Set from FastScions. Description: 13-16 Scion FR-S; 13-18 Subaru BRZ Mud Flaps by Rally Armor. Mud Flaps are available in Black and Red Colors by Rally Armor. Rally Armor Mud Flaps also available w/ White, Blue, Silver, Grey & Red Rally Armor Logos. Mud Flaps by Rally Armors.